I Just Wanna Watch TV (part 34) ??? Eh? So, I’ve got the new TV and the old tube is long gone, right? Yep, that hasn’t changed. Thankfully, the new TV has been working like a champ. Hmm, I did get the extended warranty on the new TV, but they shouldn’t have any reason to be bugging me now. Yep, you guessed it. 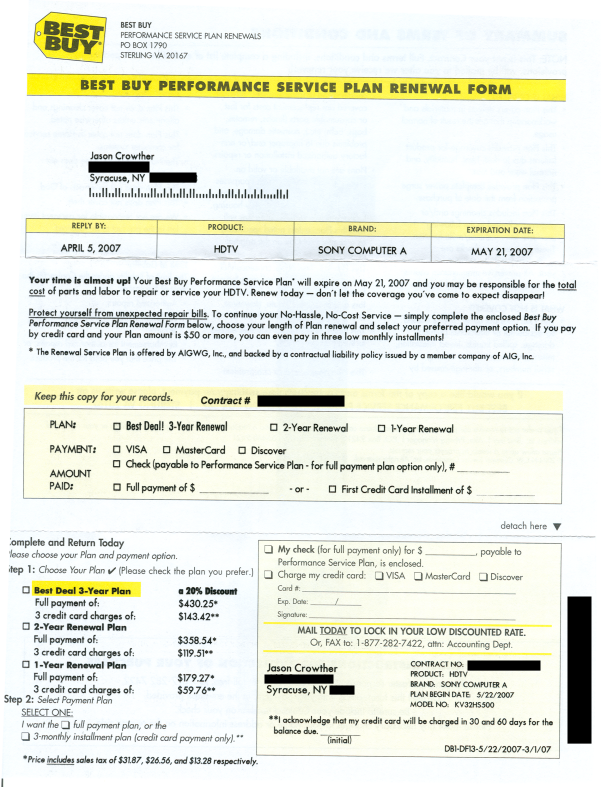 Its a renewal form for the extended warranty plan on the old TV. Just to catch you up (if you’re joining the saga just now…) this TV was returned to Best Buy (who mostly likely wheeled it straight off to a landfill) after a few months wrangling with the extended warranty folks. A couple of interesting things to note. Why is the brand Sony Computer A? Kinda strange for a TV. The extended warranty provider is no longer NEW, but AIGWG (still can’t find a website specifically for them) who provides the services I hope I’ll never need on the new TV. After a few giggles and running the correspondence through the scanner for the caps above, I laughed manically as I shoved all the papers into my cross cut shredder.